Standing in front of a Fort Worth courthouse last month, Texas Attorney General Ken Paxton announced an effort to strike back against what he described as an out-of-stater’s trampling of a Texan’s First Amendment rights. In this case, the aggrieved constituent was a multinational oil and gas conglomerate: Exxon Mobil Corp., headquartered in Irving. The company was asking a Texas court to halt a U.S. Virgin Islands investigation into what it has known about how burning fossil fuels accelerate climate change. And Paxton, with Alabama Attorney General Luther Strange — a fellow Republican — had just filed a plea to intervene in the case. Though Paxton and Gov. Greg Abbott, his predecessor, have often lined up with energy industries and other business groups in opposing various federal regulations in court, Hester and other legal experts could not recall Texas wading into a similar battle concerning just one corporation. “Typically, large corporations don’t need a lot of assistance from the Attorney General,” David Adelman, a professor of environmental law at the University of Texas at Austin. Associate Deputy for Special Litigation Austin Nimocks, who is leading the the Exxon Mobil-related effort in Paxton's office, pushed back against characterizations of the office going to bat for one company. “Our intervention was not in any way technically or realistically on behalf of anybody,” he said. “We intervened on behalf of the State of Texas." The squabble is part of a new front in a broader debate about how — and to some extent whether — the nation should pitch in to combat climate change, a phenomenon exacerbated by carbon dioxide and other greenhouse gas emissions, according to the overwhelming scientific consensus. The political context is relatively straightforward: Paxton is siding with a host of anti-regulation Republicans in pushing back against aggressive actions — from mostly Democrats — to address climate threats by cracking down on emissions. But the legal nuts and bolts of the Virgin Islands case and similar battles are far more complicated. Here’s a guide to Paxton’s effort and how it fits into the much broader climate change battle in the United States. What are Exxon Mobil and the Virgin Islands fighting about? In March, Virgin Islands Attorney General Claude Walker issued a subpoena demanding that the energy giant produce four decades of internal records related to the company’s understanding of climate change. Walker, who has accused Exxon Mobil of manufacturing a product that is "destroying this earth," is examining whether the company violated the territory's anti-racketeering laws. The investigation is largely focused on whether Exxon Mobil misrepresented its “knowledge of the likelihood" that its products and activities contributed to climate change, according to the subpoena. Walker, a political independent, is among at least four U.S. attorneys general — including Democrats in New York, California and Massachusetts — investigating whether Exxon Mobil publicly downplayed the risks of manmade climate change, even as its own scientists warned company executives of the phenomenon’s consequences and published research along those lines. That effort has emerged amid a high-profile legal battle over President Obama’s Clean Power Plan, which has split attorneys general mostly along party lines. The Exxon Mobil investigation followed a series of reports by the Los Angeles Times, Inside Climate News and other outlets revealing inconsistencies in the ways the company approached climate change in-house and publicly. The company has repeatedly denied any wrongdoing. “This is a preposterous, illogical thesis that we somehow knew all there was to know about science before it was developed and before the rest of the world’s experts,” spokesman Alan Jeffers told the Tribune. The conglomerate has refused to turn over the records. In April, it asked a Texas district judge to quash the Virgin Islands subpoena. In its lawsuit — since moved to a U.S. district court in Fort Worth — Exxon Mobil alleges that Walker’s subpoena is politically motivated and violates several constitutional protections: free speech, to be free of unreasonable searches and seizures and due process of law. What is Texas arguing in court? Publicly, Paxton has framed this almost entirely as First Amendment issue. “Attorney General Paxton Intervenes in First Amendment Case,” was the headline on a press release announcing his intervention. Exxon Mobil has also made that argument, which is gaining steam. In an open letter published this month, a dozen other attorneys general joined Paxton in calling for an end to the investigation, citing free speech concerns. Critics of Exxon Mobil suggest that Paxton and others making such arguments are failing to distinguish First Amendment rights from prohibitions against fraud — misrepresentations to investors. But Texas and Alabama don't specifically raise the speech issue in their filing, which focuses on Walker’s use of outside counsel: the high-profile class-action firm Cohen Milstein, based in Washington, D.C., which could stand to profit in Exxon Mobil was made to pay penalties in the case. Walker contends that the firm is only assisting the Virgin Islands, which has not delegated it prosecutorial authority. Hester, the University of Houston expert, said it is not rare for attorneys general to use outside counsel in major public nuisance or environmental cases (one example: states' battles against the tobacco industry), though the practice is controversial. Prosecutors don't use outside help for criminal prosecutions, the specific issue Texas has raised in court. But the Virgin Islands, he added, is more likely to pursue a civil case — not a criminal one. Does Texas have standing in the case? That’s undecided. As of Monday morning, the court had not ruled. Will Paxton insert himself into Exxon Mobil’s other climate-related disputes? That’s not clear. Last week, the company asked the same U.S. district court in Fort Worth to quash a subpoena issued by Massachusetts Attorney General Maura Healey. Paxton has not yet asked to intervene. Though otherwise similar to the Virgin Islands case, Healey’s office has not hired outside help at this stage. 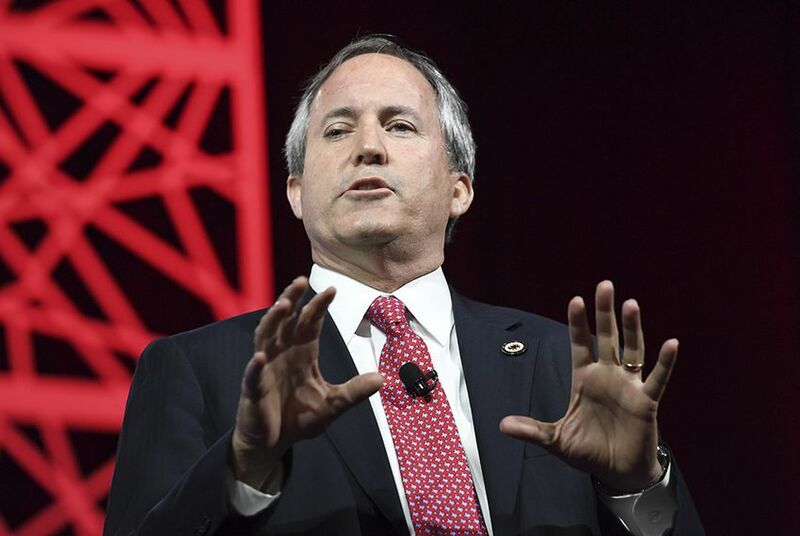 Has Paxton accepted political contributions from Exxon Mobil? Yes, but not many. Since 2005, Paxton has reported receiving just $6,350 from Exxon Mobil employees and its political action committee, according to Texas Ethics Commission data. But as is typical in Texas, he has received hundreds of thousands of dollars from fossil fuel interests at large. Are any other Texas officials involved in this fight? Ralph Duggins, a partner at the firm Cantey Hanger and vice chairman of the Texas Parks and Wildlife Commission, is one of Exxon Mobil's attorneys in the Virgin Islands and Massachusetts cases. He referred questions about the case to Exxon Mobil's press office. Does Exxon Mobil currently refute the overwhelming scientific consensus that humans are accelerating climate change? Unlike many Texas Republicans, Exxon Mobil says it outwardly accepts the science today. “We are very interested in being part of the solution to the risks of climate change,” Jeffers, the company’s spokesman said, noting its major investments in efficiency technology and carbon capture projects. Exxon has also called for a tax on carbon, and Jeffers said it has been disclosing climate risks to its investors for several years. The issues swirling in the legal case concern when Exxon acknowledged those climate realities and how it portrayed them in years past. So statute-of-limitation questions could also arise. Disclosure: Exxon Mobil Corp., the University of Houston and the University of Texas at Austin have been financial supporters of The Texas Tribune. A complete list of Tribune donors and sponsors can be viewed here.